Boris fans certainly get their money’s worth from the prolific, shapeshifting Japanese band. Their constant refusal to be pigeon-holed means that theirs is a discography from which you can pick and choose your own identity for the band, and the surprising thing is that pretty much every aspect of their output is great and fascinating in its own way. Boris have experimented with Sleep-worshipping stoner epics, abstract ambient, electronic noise, punk, doom and new wave to name a few, so when they announced that their new album, ‘Noise’, was to be a career-spanning effort, one couldn’t help but worry about the results. Was there really a way of marrying their collaborations with Merzbow, with their long-form songs ‘Absolutego’, ‘Feedbacker’ and ‘Flood’, and, say, the relatively light and airy shoegaze, new wave pop of ‘Attention Please’? In reality, ‘Noise’ eschews Boris‘ noise rock leanings and instead re-explores what they’re best known for (and arguably best at) – melodic doom, stoner and punk. However, you can certainly hear hints of their evolution scattered across ‘Noise’s eight tracks. Opening song, the appropriately named ‘Melody’, sets the album off in suitably energetic and urgent fashion, combining the frenetic punk of their breakthrough album ‘Pink’ with the melodic electronica of ‘Attention Please’. Both ‘Quicksilver’ and ‘Vanilla’ demonstrate Boris’ fondness for breakneck rock n’ roll, whilst deftly incorporating penetrating melodies into both tracks, and the former even ending in a series of doom-style guitar blows. ‘Ghost Of Romance’ takes the band into more subdued territory, recalling some of the songs on Baroness’ recent ‘Yellow & Green’, with its melancholic, clean guitars and strong emphasis on melody. This extends into the following track ‘Heavy Rain’, Wata’s plaintive voice belying the crushing guitars which suddenly arrive to add heft to the song’s main melody to breath-taking effect on one of the album’s standout songs. The awkwardly twee ‘Taiyo No Baka’ may be the album’s one misstep, if only because it’s so jarring in the tracklisting, sandwiched between one of the album’s best songs and the longest. While it has some redeeming features in some of the textures of melody, guitars and electronics in the bridge and middle-eight, the main thrust of the song is a somewhat bewildering amalgam of American pop-punk. ‘Angel’, on the other hand, is a slow-burning epic, a nineteen minute nod to fans of Boris’ long-form songs. In particular, ‘Angel’ recalls the ebb and flow of ‘Flood’, beginning with a lone, pensive guitar and Takeshi’s emotive vocals before exploding into a barrage of distortion whilst maintaining the album’s ever present sense of melody, before abruptly returning to the opening coda. Let’s be honest – if Boris ever did make an album that was truly career-spanning, it would probably be a very long, incoherent mess, which is ultimately praise for the diversity of their back catalogue. What the band has done with ‘Noise’ is what so many Boris fans do – they’ve cherry-picked their own amalgam of Boris styles and combined them in the tracklisting, occasionally blending these styles together within the tracks themselves to brilliant effect. Ultimately this means that some of the better loved and presumably best-selling moments in their career are strongly represented while others are not. 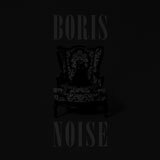 Fans of ‘Pink’, ‘Flood’, ‘Attention Please’, ‘Altar’ and even ‘Heavy Rocks’ (the first one) will be in heaven with ‘Noise’ but, ironically enough, fans of their noisier, experimental work will likely want to give this one a miss and revisit the records where Boris truly make a racket. And that, my friends, is the beauty of Boris because they’ve done it all and they’ve done it all well. If you’re new to Boris, ‘Noise’ may be the ultimate starting point, and if you’re a long-time fan, ‘Noise’ is like a convenient mixtape of their more accessible output.